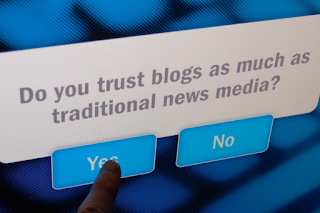 Now The Details: Should News Reporters Be Bloggers? Should News Reporters Be Bloggers? The issue is somewhat more complicated than it appears. Jodi Rudoren is the New York Times correspondent in Jerusalem. She has been tweeting and posting her observations on social media sites. Some of her comments have been interpreted as pro-Palestinian by readers who identify as pro-Israel. Rudoren is an experienced reporter who has done great work covering a highly scrutinized part of the world. But the complaints were enough for the Times to assign an editor in New York to vet her tweets. According to a source inside the newspaper, she had been warned by her editors to be circumspect. But in the end, it was decided that her tweets and blog posts should be edited. Some have described this as censorship and an affront to Rudoren's first amendment rights to free speech. Others say that Rudoren is entitled to her opinions which are protected and that she has no first amendment right to work for the Times. On November 30th, I was invited to debate this on CBC Radio's "The Current." My debate partner was Kelly McBride from The Poynter Institute in St. Petersburg, Florida. Kelly is a highly respected expert on media ethics. It boiled down to whether it's ok for social media to reveal bias, or whether reporters should self-censor in the interest of journalistic credibility and professionalism. I thought the program was a good exploration of the power and influence of social media at a time when newspapers and broadcasters are feeling diminished. I've posted the link here, and would be interested in your thoughts.